All the roads lead to Stellenbosch University this year for the USSA tournament. 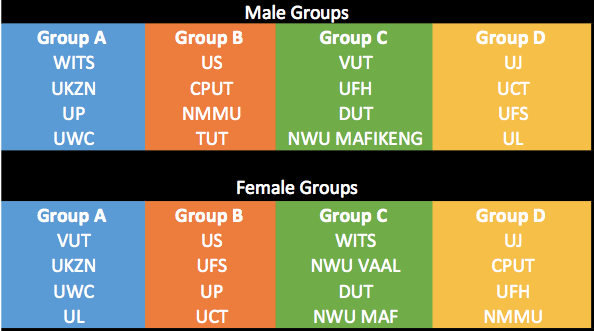 This competition will be hosted in a cold and dry (level 4 water restrictions) province of Western Cape from the 3rd to the 7th of July and pits all the best university teams in both the ladies and Mens’ categories. The money will be on the teams from the north with Gauteng, Kwazulu Natal and Limpopo amongst the usual suspects. With the home support behind their backs, there might be one or two surprises with the Western Cape teams with Cape Peninsula University of Technology (CPUT) and the University of Cape Town (UCT) looking to take any advantage given to them. Last time around in 2016, there were a few surprises with the University of Witwatersrand (Wits) winning the tournament in the Men’s division over Vaal University of Technology (VUT) while the VUT ladies took the trophy for the ladies against Wits. We expect these teams to still be in the running this year but with a few more close encounters and exciting games on the menu, we might end up with a different champion in 2017. The University of Stellenbosch who are hosting the tournament are busy building their basketball program but it’s still early days for them to compete with their more seasoned counterparts but they might be that dark horse of 2017. Games start at 8am with the last game scheduled for 18:30. Bring some warm clothes and blankets and go out there and support all the teams.